You know what, I’m thinking Apple (NASDAQ:AAPL) might be a stock worth investing some money into over the long haul. Now by no means am I a stock investor, or an analyst. But I’m just looking at the this from an average Joe position. Just yesterday, Apple beat out Exxon Mobile to become the world’s most valuable company with Apple earning what is now (as of 1:17pm EST, 8.12.11) a market cap of 350.40 billion dollar – something Apple has never accomplished before. So you’d think that Apple is growing by leaps and bounds, and you’d be right – it is. But consider also that Apple hasn’t even broken ground in any major way in China yet with the iPhone and iPad. And also consider, according to Apple Insider, that Apple’s iPhone has only 4 percent to 5 percent share of all mobile phones, and the Mac owns a similar share of total PC sales. And just glancing at the media frenzy that’s already building around the upcoming Apple iPhone 5 and iPad 3, or iPad HD – and couple that with these products launching in China and other international companies, you’re talking about something on the scale that the world has never before seen. So you think AAPL stock and market cap is through the roof now, wait until it doubles or triples in value. 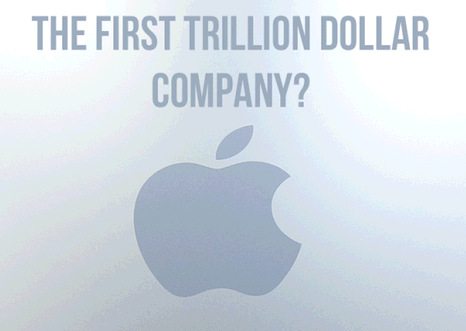 With AAPL market cap right now sitting at 350.40 billion – multiply that by 3 and you have a company with market cap of 1.05 trillion (that’s right – trillion) dollars.